The pressing need to redress the imbalance of football’s finances at the grass roots level is revealed in the latest set of accounts lodged at Companies House by Berwick Rangers. In the year to May, 2014, the Scottish League 2 side – founded in 1884 -had a wage bill of £186,016 for a total of 25 employees, including 19 “production staff” comprising the players and player/manager Colin Cameron who took over from Ian Little in January. Thus the weekly wage bill for the whole set-up at Shielfield Park totalled £3,557 - averaging out at £143 per employee. It means that expenditure on wages for the entire staff is less than half the average £8,000 a week currently being “earned” by each player with Scottish Championship side Glasgow Rangers. And Berwick’s annual wage bill is just over half the weekly pay packet of Manchester United star and England captain Wayne Rooney. 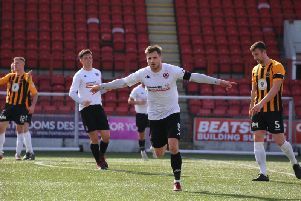 On Saturday, 430 people turned up in a stadium which holds ten times that many to watch the “Wee Gers” earn a Scottish Cup fourth round replay with Albion Rovers after a 1-1 draw. The accounts suggest that, in the absence of a radical redistribution of football’s wealth, a decent cup run is essential for the club as its strives to move up to League 1. How everyone at Shielfied must yearn for an emulation of the side’s Scottish Cup feat in 1967 when, managed by Jock Wallace, they beat Glasgow Rangers in front of a record 13,365 spectators at Shielfield, before losing 1-0 to Hibs at Easter Road in a tie watched by a crowd of nearly 30,000.